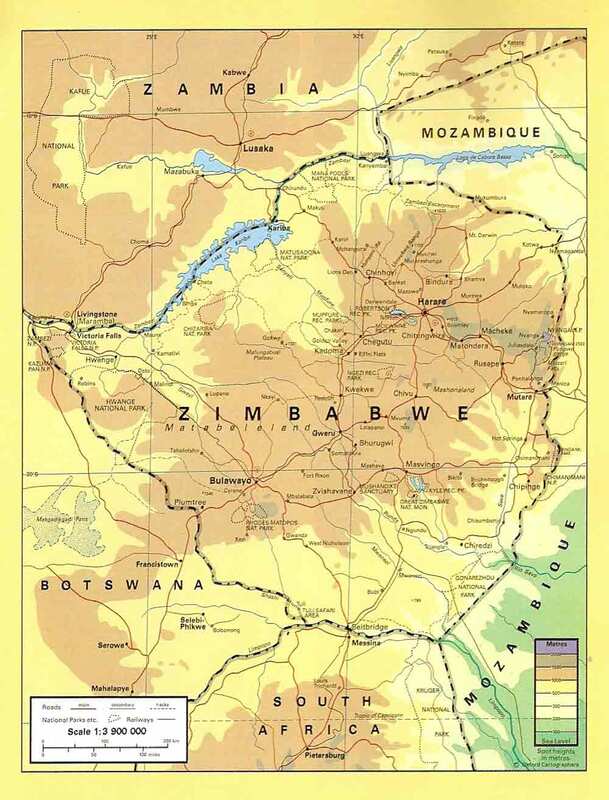 The Map of Zimbabwe below shows the surrounding countries with international borders, provinces boundaries, the national capital Harare, provinces capitals, major cities, main roads, railroads and airports. The country, part of the great plateau that is a major feature of the geography of southern Africa, lies wholly to the north of the tropic of Capricorn and covers a total area of 390,580 square kilometres. 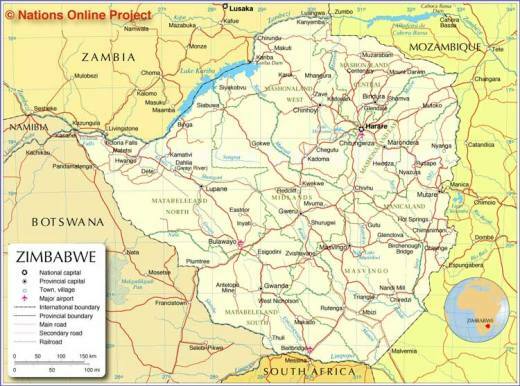 Thanks to Nations Online Project for the above Zimbabwe Map. You are free to use this map for educational purposes, but please refer to the Nations Online Project. Zimbabwe is roughly 3 times the size of England and almost the same size as California. Most of the country stands 300 meters or more above sea-level, over 75% is above 650 meters and 66% of the country is above 1000 meters. The highest point in the country is Mount Inyangani at 2592 meters in the Eastern Highlands and the lowest point 250 meters is at the Save/Runde confluence in the south-eastern corner of the country. 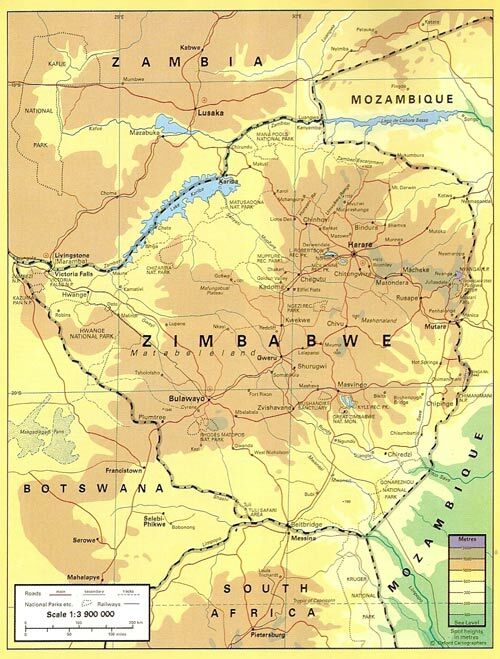 The most outstanding geographical feature is Zimbabwe's central plateau, (shown in brown on the above Zimbabwe map) known as the Highveld running about 650 kms from north-east to south-west and 80 kms from east to west, it is bordered on each side by the Middleveld. The other outstanding feature is Africa's fourth largest and least spoilt river the Zambezi, which marks the countries northern border with Zambia and which gave birth in the 1960's to what was then the world's largest man-made lake; Kariba. 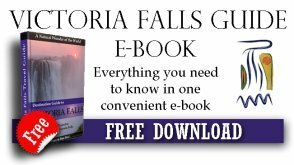 In the very western tip of the country the Zambezi river plunges over the Victoria Falls. Twice the height and one and a half times the width of North America's Niagara Falls. To the east the Eastern Highlands form a narrow north-south trending mountainous belt some 250 km in extent along the Mozambique border (shown in dark brown and purple on the Zimbabwe map above). This is the most varied geomorphic province in Zimbabwe and a complete contrast to the lowland areas of the south east.